Peter Strickland is one of the most visceral, instinctual filmmakers working today. He has an innate understanding of the majesty of the medium, an expert's ability to play with the traditional limits of the form and weave a hypnotic on-screen tapestry of sound and vision. While this ethereal, giallo-esque approach makes for unique cinematic expression, this wilful, frustratingly elusive style fails to mask the limitations of the narrative. As with all his works, Strickland's central idea is immediately intriguing. A stunning red dress, purchased from bizarre 70s-throwback department store Dentley & Soper, brings curse and chaos to the lives of those who wear it. 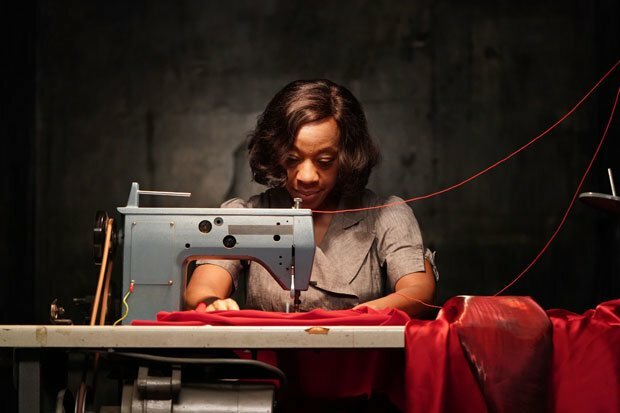 The first, lonely 50-something single mother Sheila (a brilliant Marianne Jean-Baptiste) wears hers on a couple of dates and seems to find love, only for fate to deal a horrifying hand. And, later, washing machine repair man Reg (Leo Bill) and his fiancé Babs (a wonderfully low-key Hayley Squires) find the dress adds an incendiary spark to their humdrum life. There's an interesting duplicity at play here, with the otherworldliness of the store — in which mannequins bleed, ghoulish store manager Mr Lundy (Richard Bremmer) skulks in the shadows and the darkest of magic is clearly at play — contrasting sharply with the dull mundanity of the lives of the dress owners. There is also well-observed commentary about the modern cult of consumerism; fuelled by its transfixing, blood-red TV ads, the store has a bewitching, almost religious hold over its customers, who mob the door each morning and rush to take advantage of a sale, which eventually spills into violence. An appealing thread of off-kilter humour also runs throughout. The way in which, for example, bustle-wearing, heavily-accented shop assistant Miss Luckmore (regular Strickland collaborator Fatma Mohamed) glides around the floor, speaking in poetic riddles ('In apprehensions lie the crevices of clarity!' she tells a hesitant Sheila), before taking off her voluminous wig and folding herself into a dumb waiter at night, to descend into the hellish bowels of the building. And Sheila's bizarre bank manager bosses (Steve Oram and Julian Barratt) are a particular highlight, their campy double-act a welcome light relief. Augmented by a highly-strung, insidious score by Cavern of Anti Matter, and some truly lush cinematography from Ari Wegner (Lady Macbeth) — that the dress colour is called 'artery' is the jumping off point for both the store's vivid, fleshy colour palette and a mesmerising final sequence — In Fabric is, like the central garment itself, masterfully crafted and undeniably gorgeous to look at. Yet, despite its beauty, and despite the brilliance of individual moments, it never coalesces into a satisfying whole. This is, one suspects, partly by design — that Strickland intends his films to play as fever dreams is evident from his past works — but it's also down to a tone that veers wildly between knockabout comedy, kitchen sink drama and gothic horror; wilful disorientation being augmented by a cacophony of sound and disparate images at random moments. There's also no getting away from the troubling fact that, much like Duke of Burgundy before it, In Fabric is a film populated by captivating women but shot entirely from, and for, the male gaze. Strickland's fascination with the female form provides some of the film's most striking images — Sheila's soaring confidence as she tries on the red dress, the assistant's fabulous Victoriana uniforms — and also some of most troubling. Babs, for example, has an obsession with her dress size that results in some nightmarish imagery, and a sequence in which a fleshy female mannequin is washed intimately by Miss Luckmore and a colleague, for Mr Lundy's voyeuristic pleasure, oversteps kitsch eroticism and become something much more problematic.